A Kart in GTA San Andreas (Rear quarter view). The Kart is a go-kart in Grand Theft Auto: San Andreas. As implied by name, the Kart is a small low-profile go-kart constructed with the barest of materials and is a one-seater capable of carrying only the driver. The vehicle is usually depicted with bare frame and a frontal bumper, but may also be available with additional matching side skirts. Other features include its rear engine and small racing slicks. Being very compact, the Kart's low-powered engine is adequate in providing the vehicle with average speed, good acceleration and good mountain climbing, and allows the go-kart to execute sharp turns and brake in very short distances. However, these traits may also work against the maneuverability of the vehicle, as the steering is overly sensitive (thus requiring the player tap the steering controls instead of holding it), and the vehicle's low profile and light weight makes drives onto curbs or crashes into larger, heavier vehicles risky as the vehicle may spin out or flip. Unusually, being a fully exposed vehicle, the player cannot dismount from the Kart during violent crashes or flips; neither can the player shoot forward, despite the Kart having a clear frontal field of view to do so. The Kart plays the radio station Radio X by default when entered. The Kart has the unique ability to be able to drive under larger vehicles. examples include the Tanker trailer and Monster, or any other vehicle with high ground clearance. The Kart can turn as if "Perfect Handling" cheat is on. However, the cheat still takes the body roll effect from high speeds combined with sharp handling. Outside Madd Dogg's Crib in Mulholland, Los Santos. Behind a Xoomer gas station, near the Easter Basin Naval Station, San Fierro. In an alley next to Zero RC in Garcia, San Fierro. In a building in El Quebrados, Tierra Robada. In one of the shacks atop Arco del Oeste in Bone County. In the Angel Pine trailer park in Whetstone. In an alleyway in Chinatown, San Fierro, near a Katana. Behind the Blackfield Stadium in Blackfield, Las Venturas. Under a bridge, in the sewer lines of Ganton, Los Santos. In front of a house, near the Redsands West Safe House in Redsands West, Las Venturas. In the backyard of the house next to a "s-bend" in Prickle Pine, Las Venturas. On the parking lot to The Well Stacked Pizza Co. and Zip, Starfish Casino, Las Venturas. In front of two apartments in Ocean Flats, San Fierro; one on the south-western end and the other on the south-eastern end. 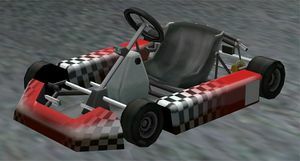 Before "Cut Throat Business", the Kart is also used as the principal racing vehicle for "Go-Go Karting", a race in Doherty in the San Fierro leg of Race Tounaments. Go Kart, GTA Chinatown Wars equivalent. This page was last modified on 11 January 2013, at 14:44.